Jim over at the Unholy Rouleur blog writes some interesting stuff and has a good way with words. If you haven't checked it out before, you should do it. And I'm not just saying that because he played 20 questions with me. But since I've already subjected you to some self promotion, I might as well throw a picture of myself up on this post to continue the trend. Fortunately for you it doesn't include my face. Photo by M. Dunn. Well, the rain has been pretty relentless since I returned from the VA trip (final reports soon, I promise). Heavy storms, frequent rain, general wetness, trails soaked most of the time. Let's hope things are doing a little better in Hazelton, WV. Why is that you ask? Well, this weekend is the annual 24 Hours of Big Bear and we'll be heading out with a team of fixed gear riders again this year. Always a good time, but dry trails are preferred. 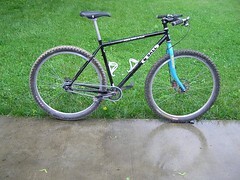 I need to get some saddle time on the Qball, I haven't spent time on the fixed MTB lately. Let's hope I can quickly find my Mojo. Here's the Big Bear reports from 2008 and 2007 in case you feel like reliving the fun. Big Bear tends to be like a big MTB family reunion, maybe I'll see you out there. Look for the Clipper City and SSOFT banners.